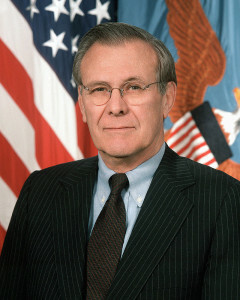 AGRP is proud to announce that our keynote speaker will be Donald Rumsfeld, former Secretary of Defense. The AGRP Annual Meeting is the annual meeting for the advocacy and government relations profession. No where else can you combine networking, information, education, and professional development in one place in Washington DC. Join your colleagues from all industries and backgrounds to celebrate what makes this profession great and recognize the valuable public service we provide to our clients and the public. Ivan Adler, a former AGRP Board member and a well regarded recruiter, will kick off our speed networking, where attendees can meet multiple mentors and industry veterans to learn some career tips. Hear from our bipartisan, bicameral panel of Congressional leadership staff about what to expect in 2016 and even the rest of 2015. Get some work done over dessert! Join your fellow AGRP members in electing the new slate of Board members and officers, and hear a “state of the association” update from leadership. Join AGRP as we honor our Professional Lobbying Certificate recipients, GR Professional of the Year, GR Campaign of the Year, and GR Career Achievement Award. AGRP is proud to welcome our keynote speaker: former White House Chief of Staff, former Congressman, twice Secretary of Defense, philanthropist, and author Donald Rumsfeld will talk about keeping your brand relevant in politics. For the first time ever, AGRP is hosting a post-Annual Meeting VIP reception. Attendees who purchase this special registration are eligible to attend a special reception hosted by the AGRP Board with our keynote speaker. Attendees receive a signed copy of his leadership book. Want to meet our keynote speaker? Make sure you sign up for the VIP package. This year’s meeting is November 12, 2015 from 10:30 AM – 3:00 PM. Registration for all of this amazing content is $229 for members and $349 for non-members (which includes a year of membership). VIP packages are only $349 for members and $469 for non-members, also including a year of membership. Register today. Position your company, association, or firm as a visible supporter of the AGRP Annual Meeting with an event sponsorship of $500-$5,000. Special opportunities are available for the Donald Rumsfeld Keynote, including the purchase of a table for staff and clients and sponsorship of the VIP reception in his honor. A photo opportunity with Mr. Rumsfeld is included in these packages. Your logo will be included on this website, in email marketing, and onsite at the event. Event sponsorships include registrations. Click here for benefits details and to confirm your sponsorship. Contact Pamela Strother at pamela@agrp.org or 202-486-5990 for additional information about this event or about AGRP’s annual partnership program for year-round marketing to the AGRP audience of 13,000 government relations professionals and policy makers.